One of my new year resolutions this year was to visit more of England's chalk hill figures, such as a white horse, that I hadn't been to before. So on my return journey home from my holiday in Cornwall in August, I took a detour to visit the Westbury White Horse, in Wiltshire. This is one of the county's oldest white horses. It was cut into the hill in 1778, but is thought to have been a replacement for a much older chalk figure, possibly commemorating King Alfred's victory over the Vikings. Westbury White Horse is on the hillside below Bratton Camp, which is an Iron Age hillfort that in turn encloses a much older long barrow. As well as visiting the site at the top of the hill, I took this photograph from the road that runs below it. 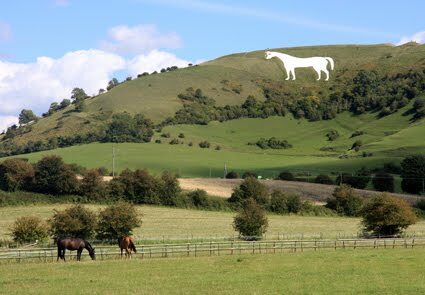 I like the juxtaposition of the white horse at the top of the chalk hill overlooking two real horses grazing in a field in the valley.